with Juda Rowan Gallery, London. Reynolds was born in 1926 and was brought up in Newmarket in Suffolk. The local landscape and the work of Gainsborough and Constable were important influences, especially in his earlier landscape compositions (see lots 73 and 74). He studied first at the Woolwich Polytechnic School of Art, and then obtained a scholarship to the Royal College of Art. During his time at the Royal College, he exhibited at the Redfern Gallery, and on leaving college he took up teaching at the Central School of Arts and Crafts. Reynolds explicitly stated the importance of structure and abstraction to his work in 1961: 'What I desire in my painting is structure and through that structure, poetry - the kind of poetry which is instinct with abstract visual form. I begin with a few simple shapes or forms and then improvise intuitively. It is the image - the thing in itself that for me is important. The abstract is the thing' (quoted in J.P. Hodin, Alan Reynolds, London, Redfern Gallery, 1962, pp. 7-8.) 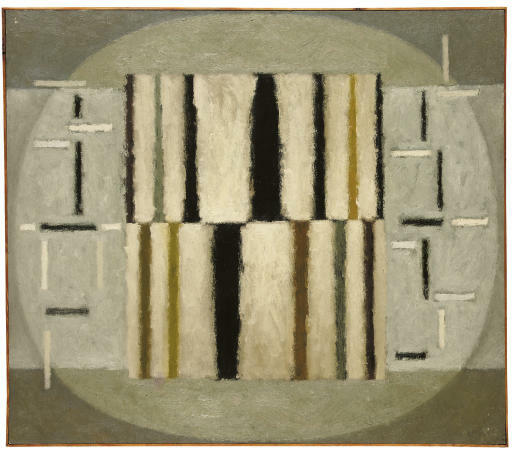 The foundations for these structural abstractions remained grounded in nature and landscape, as he described in 1963: 'Earlier my work was more obviously related to natural forms ... it is still concerned with poetry and it remains influenced by nature and my surroundings - for me it could not be otherwise' (quoted in Exhibition catalogue, Alan Reynolds, London, Gallery 27, James Huntington Whiteley Fine Art, 2004, pages not numbered).